Done well, behavioural change campaigns can help government run more efficiently and save taxpayers’ money. Tick. Tick. That could be moving the public away from costly phone or face-to-face customer contact channels toward online self-serve resources. The reduction in demand for staff support then frees up resources (and budget) for other priorities. A brilliant example of this is Birmingham City Council’s channel shift success during school admissions periods. Their use of targeted email communication at very timely moments preempts parents’ need for information. Parents then don’t need to make a phone call. Alongside the proactive comms, Birmingham uses an interactive voice response system to direct people to self-serve online. During the 2018 secondary school admissions period the campaign delivered a 72 per cent reduction in calls, equating to a £13k+ saving in one week alone. Bravo Brum. At their very best, behaviour change campaigns can make lives easier and even save them. Some of the most prominent campaigns aiming to drive awareness, understanding and action are health-focused campaigns. For example, Change4Life encourages frequent exercise and less junk food. Cancer Research encourages people to seek medical advice early on for suspicious symptoms such as blood in poo, or a cough that lingers for over three weeks. And, #TimetoChange lifts the lid on mental health. Finally, we’re talking about that. In the context of vehicle and road safety, injury and death could be avoided if people took fewer risks. Better communication to establish public awareness, education and understanding of safer driving habits is a priority for many organisations and businesses. Effective comms, easy access to information and support, and strategic interventions could help change behaviours and reduce instances of dangerous driving and fatal accidents. Each road accident casualty is estimated to cost society £1.7million, not to mention the emotional cost to those affected. You can hear how Damien Currie of the Office of the Traffic Commissioner and James Morton of Hampshire Fire & Rescue are using digital communications to educate drivers and encourage safer behaviours at Granicus’ webinar. Both communications managers will share tips for increasing audience engagement with key messages. At different times in life, many of us will likely need a helping hand to make better decisions. The way we do things (in our “everyday”, in business, or when the extraordinary crops up) is influenced by many factors. These include past experience (our own and others’), the people around us, the information available, the perceived risks, penalties and gains of each of our choices, the ease of each choice, our emotions and circumstances in the moment, and more. You might think that if someone has ample information at their fingertips, this will be enough to guide their thinking toward making a good decision or taking the “right” action. However although adequate provision and effective dissemination of information are extremely important, that may not be enough to prompt us into action. One thing that is becoming clearer is that we humans like to have an example set for us, which we can follow easily. This final principle of persuasion relates to the theory of social proof. We like to be led, and be part of a group. Crudely speaking, we think, “If all those people like me are doing that, then I should be doing that? I don’t want to miss out!”. For example, when a friend or family member recommends something (let’s say a product or service), you’re more likely to take their endorsement seriously. In fact, Nielsen reports that the most meaningful form of advertising is recommendations from friends and family: 83% of consumers in 60 countries say they trust these recommendations over any other form of advertising. This question of message, source and public trust is an important one, and perhaps best saved for another blog. But we do know trust in government and public institutions is at an all-time low (Edelman) and so the public sector must work doubly hard to earn customers’ trust. How is your organisation doing this? Are you committed to transparency and critical feedback? Are you using social proof in your campaigns to make a quicker connection with your audience? If your organisation’s “voice” isn’t weight enough, could you be adopting social proof tactics such as customer-led testimonials to help convince more people to “listen” and then “do”? Given the power of peer-to-peer recommendations, it’s no wonder that communicator across all sectors are trying to ethically leverage social proof to increase sales, drive greater adoption of a service, and encourage specific behaviours. 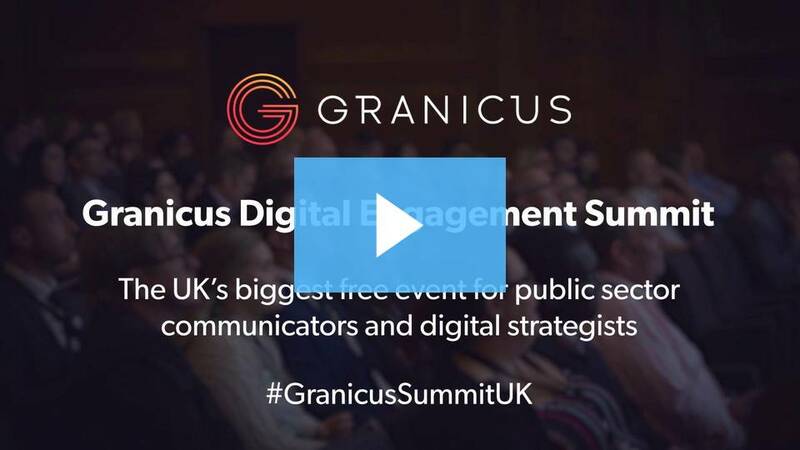 When we came to produce a new video to promote the 2018 Granicus Digital Engagement Summit (20 Sept), we leveraged several proof points. I’m hoping the positive testimonials from Alan, Rob and Ashley – and the fact 300 people attended in person last year – will help persuade some of you to register for this brilliant free event in London :)? Another great example of using social proof is in the promotion of “recycling rewards” initiatives by councils including the London Borough of Hackney. They’re encouraging more sustainable recycling behaviours by offering incentives and celebrating residents’ achievements. Kirklees Council also deploys communication that calls out good recycling, and subtly persuades others not towing the line to buck up their ideas, making them feel “outside the norm”. Viki and the team at Kirklees do pretty awesome comms all-round, but their recycling updates really deserve recognition – especially when one email leads to a 50 per cent reduction in contamination. So good! It’s not just residents who need support and encouragement to live healthier lives, on the right side of the law. If you’re able to join the webinar, you’ll also hear from Kirsty Edwards of the Intellectual Property Office about how they’re reaching and engaging businesses – especially entrepreneurs with minimal knowledge of intellectual property (IP). IP includes copyrights, trademarks, designs and patents, and the absence or misuse of these can damage businesses and undermine the proper functioning of our marketplace. Kirsty will share how specific tactics are helping to empower more businesses to protect their creativity, reap the benefits of their ownership rights, and understand how not to infringe other businesses. Regardless of your audience or objective, the webinar will include tips that can be adopted in any communications campaigns. It takes place on 10 July at 11am and you’ll be able to learn from three comms managers who are helping to change behaviours. Hear what tactics are resonating with audiences and driving decisions that make our communities safer places to live, work and do business. We hope you can join us - If I tell you 200 people have already registered (yes, really), will you go ahead and register?